Pattermania is a special revue of Gilbert & Sullivan's most daring tongue-twisters and famous songs. 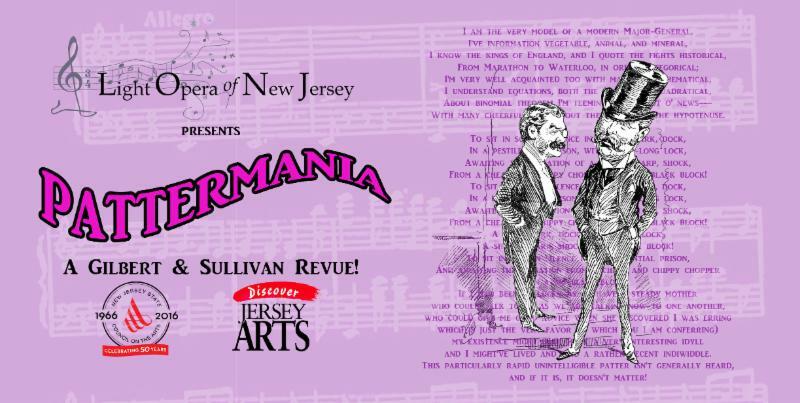 Directed by William Corson, Pattermania is a delight for the whole family and a chance to share the joy of operetta with friends. The revue features Gilbert and Sullivan's most well-known patter songs "I am the very model of a modern major general" from Pirates of Penzance and "To sit in solemn silence" from The Mikado with many other favorites tunes from both of the shows and selections from HMS Pinafore, The Sorcerer, The Gondoliers, Yeoman of the Guard, Patience, Princess Ida, Iolanthe, and Rudigore. The talented cast will be accompanied with orchestra so attendees will enjoy the full sound of Sullivan's score with Gilbert's humorous lyrics. There is still time to become a season subscriber! Save 10% on tickets to all 3 productions of our season. Return THIS FORM by October 20th to secure the best seats!